Papaya leaf juice is extracted from the leaves of the papaya plant. The papaya fruit is well known for its wide range of health benefits. But, did you know that even the juice from papaya leaves can be beneficial? Just recently, its medicinal properties to combat dengue, cancer, and other deadly diseases have been proven. This has made it very popular among the people. Dengue fever is a major concern these days, with so many rising number of cases. As such, a simple but effective treatment is required to control it. Papaya leaf juice is the solution for this problem, which is effective and even inexpensive. It can fight against the causes of dengue fever, and even cure patients who have already been affected by it. The anti-cancer properties and other wide range of properties make papaya leaf juice a well-known medicinal juice. Skin health is promoted by the Vitamins A and C in papaya leaf juice. The content in this is higher than in the fruit. You can use papaya leaf juice as an effective cleansing agent. The karpain compounds in it have the property to inhibit micro-organisms and all other kinds of toxins. As such, it makes your skin clear and clean. Pimples, blemishes, freckles, and all other such skin problems are effectively fought against. Eczema is effectively treated using papaya leaf juice. Take the juice from papaya leaves and use it to apply over the affected areas. Make sure you scrub your skin well before applying. Open wounds and sore can be treated using fresh papaya leaf juice. To make the hardened skin, and the corn or wart on the feet, you can use papaya leaf extract. Take the milky juice which is extracted from the tip of the papaya leaves for this purpose. For hair treatment, papaya leaf juice is generally used in many health care stores and salons. Use it with other ingredients like honey and coconut milk as a conditioner. It makes your hair shiny, lively, and even makes coarse hair much softer and smoother. You can control frizzy hair and make it more manageable. Anti-dandruff shampoos use papaya leaf juice extract as a major ingredient. It controls flakes and prevents dandruff. The karpain compounds in it remove oil, dirt, and even all kinds of chemical build up on your hair. There are no side effects, and your hair becomes much better than ever. Dengue is a dangerous disease that affects a number of people all over. It is caused by the dengue virus, which is transmitted by the Aedes mosquito. At times, it can be fatal and can be dangerous for the life of the victim too. High fever with headache, sever joint pains and muscle pains, red rashes all over the body leading to itches, and a drastic drop in the count of blood platelets are common symptoms of the disease. No perfect cure has been has been developed for this disease yet. Using painkillers like Ibuprofen or Aspirin has side effects. Papaya juice has been in use since olden times as a cure for dengue fever with absolutely n side effects. Researchers have proven that the enzymes papain and chymopapin are contained in papaya, which boost the platelet count or thrombocytes. It relieves the symptoms and makes you feel better. 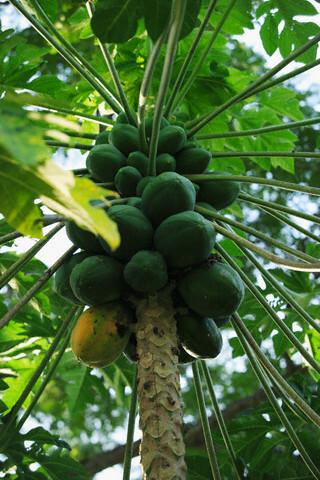 Papaya leaf extracts are used by pharmaceutical companies to manufacture liquid formi=ulas and capsules. Taking 20 to 25 ml of this juice twice daily for a week is very effective for giving quick results. Papaya leaf juice has properties to combat malaria as well. It is used in many parts for preventing malaria, as a prophylactic. The leaf extract has anti cancer properties. Certain enzymes contained in papaya have got dramatic cancer fighting properties. Liver cancer, breast cancer, lung cancer, cervix cancer, pancreatic cancer, and other tumors are effectively treated. It has no toxic effects on the body, and is thus used as part of chemotherapy in several places. Papaya leaf extract regulates the T-cells and increases the response of your immune system to cancer. Vitamins A, B1, C, and E, proteins, calories, calcium, carbohydrates, phosphorus, iron, and water are essential nutrients that are contained in papaya leaf juice. Papain is an important enzyme in this juice, which breaks down the proteins naturally to aid in better digestion. More than 50 active ingredients are contained in papaya leaf juice. These include karpain compounds that have the capacity to inhibit fungi, worms, bacteria, parasites, and other such micro-organisms, and even some of the cancer cells. A number of herbal medicines use this ingredient to remove intestinal worms. This is because of the tannins contained in this juice, which can protect your intestine from re-infection. Re-infection can be caused from tanning proteins in the intestinal wall linings. As such, the worms will not be able to attach themselves. Papaya leaf juice can suppress the cause of typhoid fever this way. Papaya leaf juice can be effectively used to fight the common cold virus and other such viral infections. It naturally regenerates platelets and white blood cells. Over 50 ingredients are contained in papaya leaf juice, which include the vitamins that support the immune system – Vitamins A, C and E.
To burn fat, boil fresh papaya leaves with sliced orange pieces. It is a great reducing agent. Menstrual pain can be effectively reduced using papaya leaf juice. Take a papaya leaf, mix some salt and tamarind, and add this to a glass of water. Boil this mixture and let it cool down. Drinking this concoction gives immense relief. As you see, the juice of papaya leaf can be used for a huge range of benefits. Use it to treat all your ailments and issues, and stay healthy. i have a tree of papaya at home is it okay to use the leaves of it and drink it. Can we grind the leaves and extract juice and drink it? I’ve tried drinking its juice, adding a little water, without boiling. Though I dnt hv any particular allergy, I did get dizzy for quite some time. Is it safe to for people with anemia and low BP?